Not surprisingly, the M3 CS is identical to the M4 CS, save for the 3 Series-specific features such as the extra rear doors and the longer roof. The fact that the presentation model is finished in Lime Rock Grey Metallic, the same color as the M4 CS introduction car, makes the similarities between the two Bimmers that much more evident. So we’re looking at the similar CS updates, which are heavily based on those on seen on the M4 GTS. Up front, the sedan’s looks and aerodynamics were enhanced by means of a front splitter made from exposed carbon-fiber and a revised apron with larger intakes that improve engine and braking system cooling. 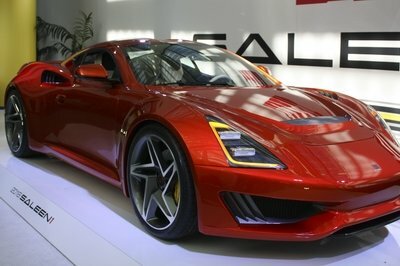 The standard engine hood was ditched in favor of a carbon-fiber-reinforced plastic unit with a massive bulge in the middle and additional vents. On top of looking more aggressive, it’s also around 25 percent lighter than that of the regular M3. The CS look is rounded off by black trim instead of chrome, which comes with the standard Shadow Line package. Onto the sides, the CS retains the usual M3 design elements, but the same Shadow Line package adds black window trim, lower mirror caps and door handles. In addition, it rides on special forged, light-alloy wheels with a ten-spoke design borrowed from the M4 DTM race car. Finished in Orbit Grey Matt, they blend almost seamlessly with the exterior paint and probably provide a great contrast with the other color options. Around back, there’s a Gurney lid spoiler made from carbon-fiber. The aerodynamic element, which helps reduce rear axle lift, is taken from the M4 CS. 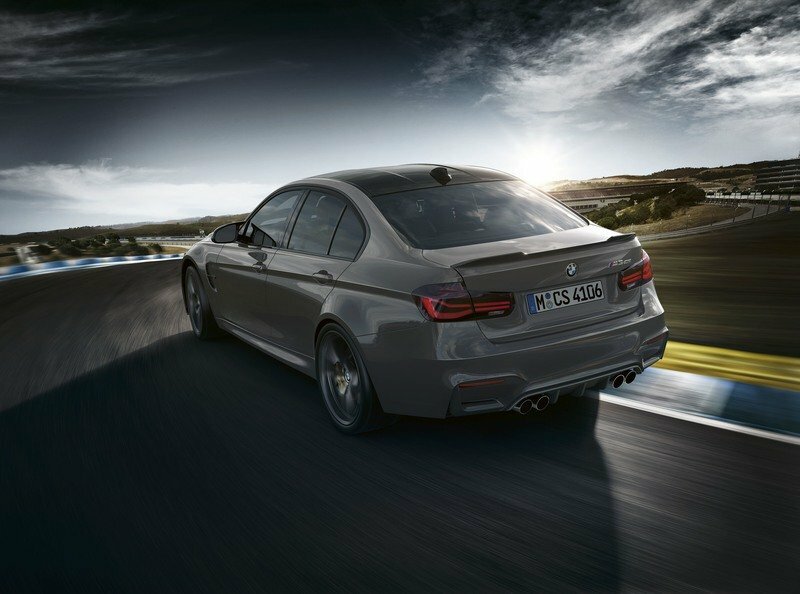 Although not as aggressive as the big wing seen on the M4 GTS, it’s better suited for the sedan’s classier, Club Sport look. The CS also shares the OLED taillights, the rear diffuser, and the carbon-fiber-reinforced (CFRP) diffuser with its coupe counterpart. The four exhaust pipes are made from stainless-steel. As far as paint options go, the M3 CS is finished in Alpine White as standard. However, customers can also opt for either San Marino Blue Metallic, Lime Rock Grey Metallic (pictured), Frozen Dark Blue II Metallic or Black Sapphire Metallic. All told, the M3 CS is nearly as aggressive as the bonkers M4 GTS, missing only the race-inspired rear wing. It’s by far the most aggressive iteration of the current 3 Series and it’s definitely more menacing to look at than the already iconic M3 CSL. 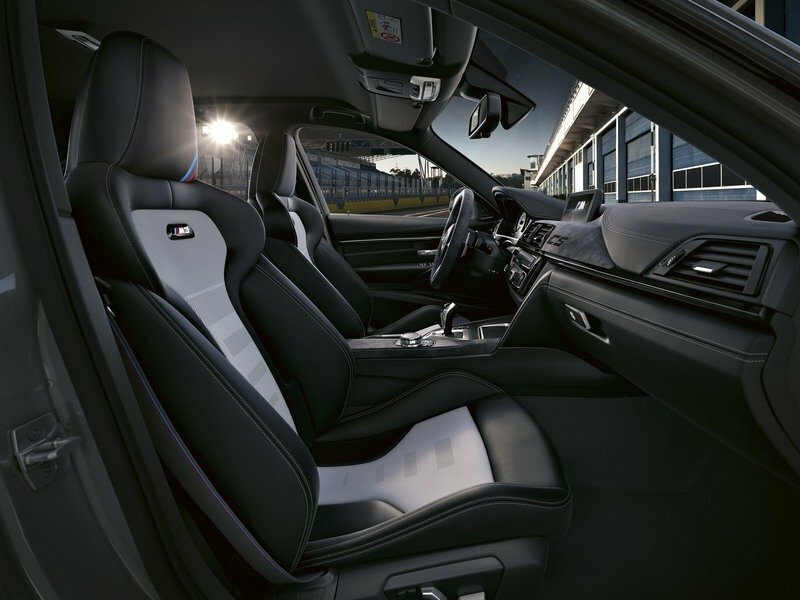 The interior of the M4 CS was transferred inside the sedan with all of its exclusive features. The cabin is almost entirely black, draped in Merino leather and Alcantara. The upper dash if wrapped in black leather with grey stitching, but the area above and around the center stack is dressed in Alcantara. Light gray “CS” lettering adds exclusivity to the dashboard. More light gray stitching is found around the glove compartment and trickles down into the center console, which features a good amount of Alcantara. The seats are the only features that aren’t completely black. Here, the black side bolsters are complemented by Silverstone center sections. That’s light grey with a dash of silver. The seats are M sports units and are borrowed from the M3 Competition Package. The steering wheel is of the same variety and features exclusive, anthracite-colored Alcantara and a silver stripe at the 12 o’clock position. The door sills feature special strips with “M3 CS” lettering. 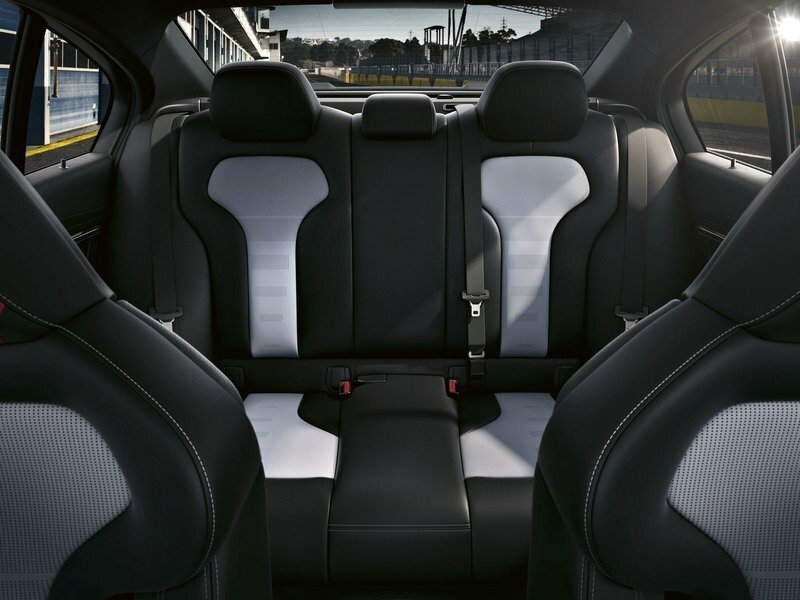 Despite being a track-oriented model, the sedan is equipped with a full range of convenience features, including automatic climate control, a navigation system, and a Harman Kardon surround sound system. Unlike the M4 CS, the sedan doesn’t have a roll cage fitted in the back. So you get a bit more everyday practicality. 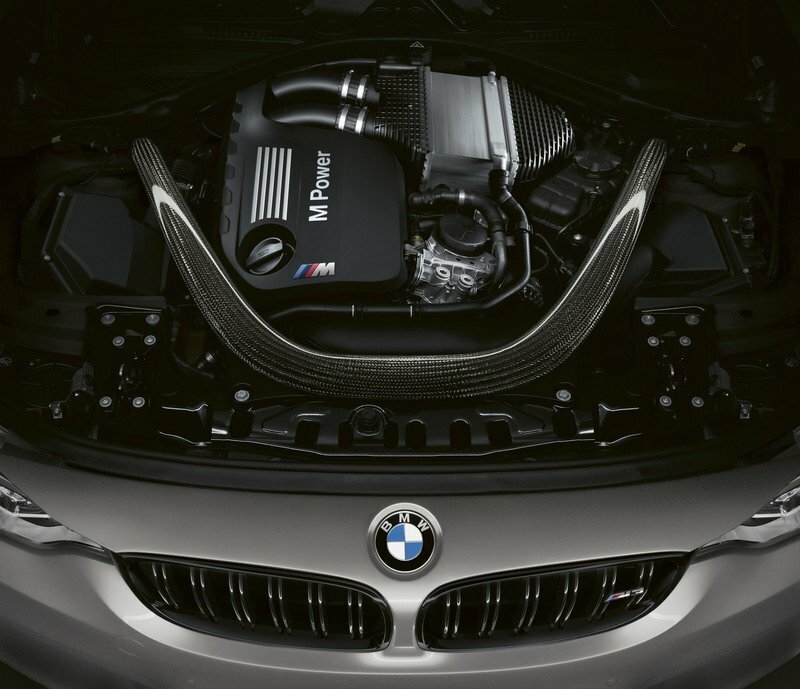 Just like the M4 CS, the M3 CS gets its juice from a beefed-up version of the twin-turbo, 3.0-liter inline-six engine found in the standard sedan. Output was increased to 453 horsepower (460 PS) and 443 pound-feet of torque, which accounts for an extra 28 horses and 37 pound-feet over the regular M3. 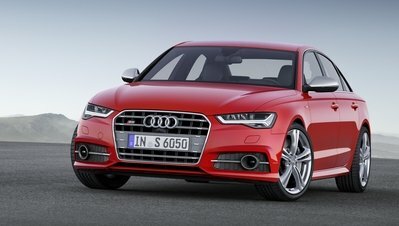 All that oomph goes to the wheels through the proven, seven-speed dual-clutch automatic transmission and enables the sedan to hit 60 mph from a standing start in 3.7 seconds, two tenths quicker than the stock model. 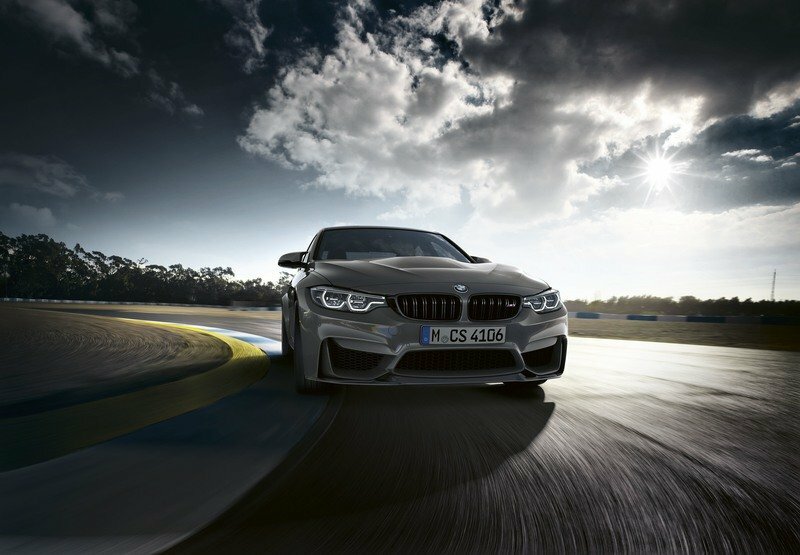 Top speed increased from the standard 155-mph rating to 174 mph thanks to the M Driver’s Package, which comes standard with the CS badge. The six-cylinder engine features BMW latest drivetrain technology, including high-precision direct injection, Valvetronic variable valve lift, and Double-VANOS fully variable camshaft timing control. 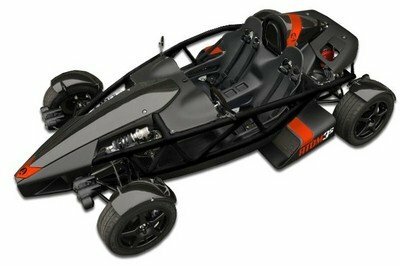 As a result, it has a maximum engine speed rated at 7,600, close to GT-spec race cars. The oil supply system is another technical highlight, having been designed with input from motorsport engineers. 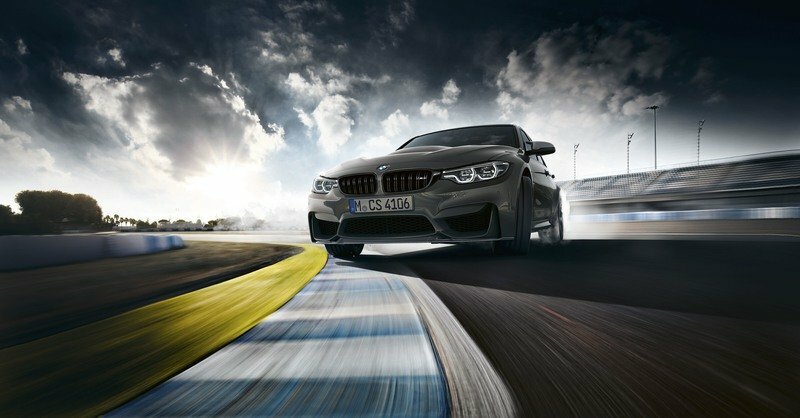 The magnesium oil pump keeps the engine lubricated under longitudinal and lateral forces of up to 1.4 g, enabling the M3 CS to tackle extreme driving maneuvers at the race track. The new exhaust pipe provides lower back-pressure for enhanced power, while a new system of flaps provide optimum feedback on the engine’s load state for a sporty exhaust note. 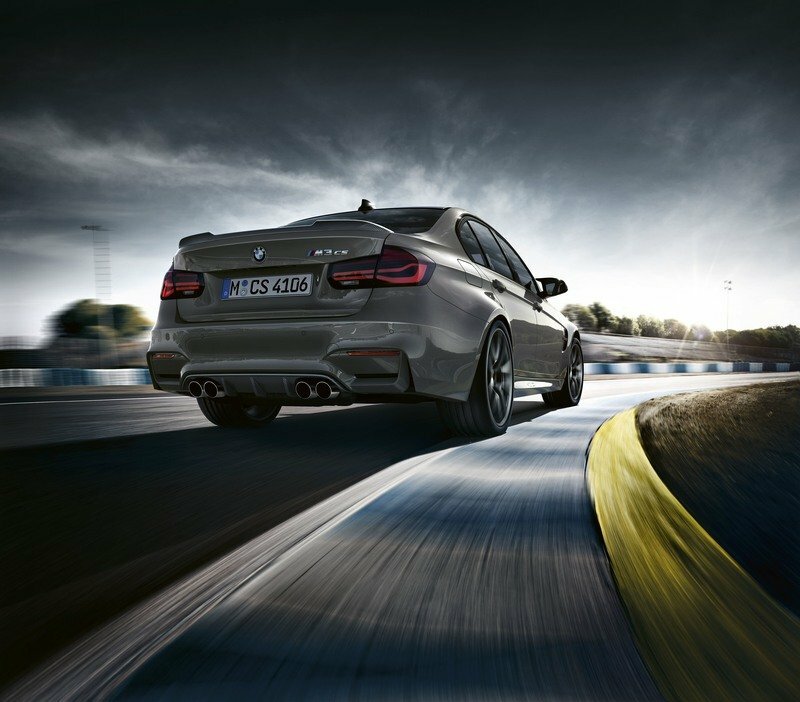 Just like the M4 CS, the sedan comes standard with the Adaptive M Suspension. This puts three modes at the driver’s disposal – Comfort, Sport, and Sport + — each using different damper and steering settings. There’s also an Active M Differential, a limited-slip unit that further enhances stability and traction. It’s pretty obvious that the M3 CS is largely an M3 Competition Package underneath, but there are a few extras to consider, including more rigid axles and revised double-joint front spring struts and five-link rear axle. The forged wheels are wrapped in Michelin Pilot Super Sport tires for increased grip, while stopping power is provided by BMW M compound brakes with four-piston calipers at the front and two-piston units to the rear. 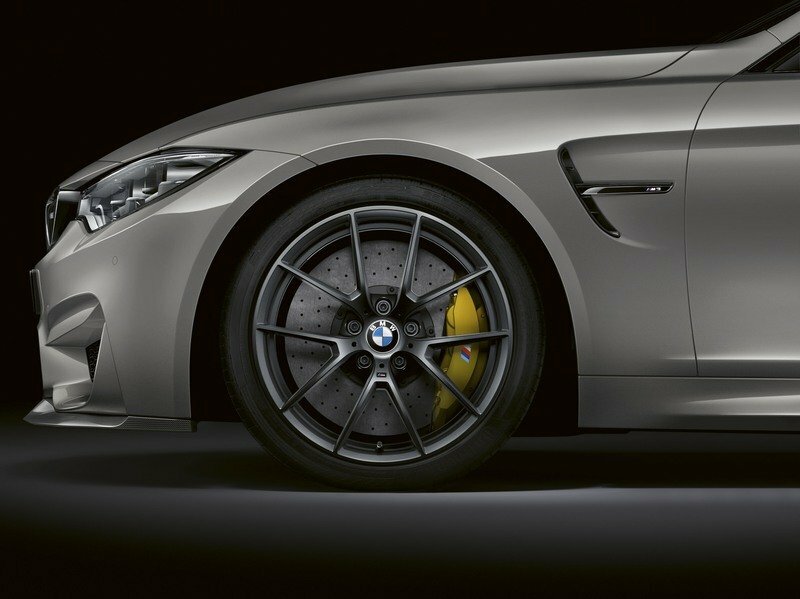 However, these can be updated to BMW M Carbon Ceramic brakes, which feature six-piston calipers at the front and four-piston calipers at the rear. There’s no word yet on whether the M3 CS completed blistering Nurburgring lap – the M4 CS did it in 7:38 minutes, but it’s safe to assume that the sedan was also tested on the German track. And I’m sure it would be almost as quick, which would put it on par with cars like the Lexus LFA and the Lamborghini Gallardo Superleggera. Only 550 to be sold in the U.S.
Pricing information for the M3 CS is not yet available, but BMW did say that order books will open starting May 2018. The German carmaker also said that production will be limited to approximately 1,200 units worldwide, with "approximately 550 units coming to the U.S." It’s a bit awkward that production numbers aren’t specific at this point, but hey, I’m not here to comment on BMW’s marketing strategy. 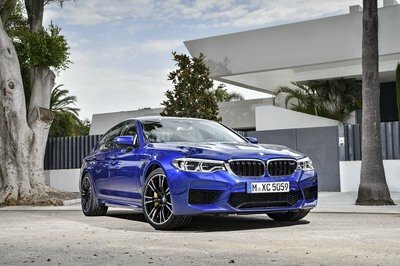 Expect the sedan to retail from around $100,000 before options, a hefty increase compared to the standard M3, which retails from $65,500. Unlike BMW, Mercedes didn’t bother to make limited-edition versions of the AMG C63. At least not the kind that brings more power and improved aerodynamics to the table. However, because the C63 is available with two power outputs, one of which is significantly more powerful than the M3 CS, the Stuttgart-designed sedan qualifies as a solid competitor for this Bimmer. More specifically, while the standard C63 uses a 4.0-liter V-8 rated at 469 horsepower and 479 pound-feet of torque, which is still more than the M3 CS, the C63 S has it engine uprated to 503 horses and 516 pound-feet of twist. The extra horsepower makes up for the lack of motorsport-style aerodynamic as they push the Merc to 60 mph in 3.8 seconds, a tenth-second slower, but top speed is rated at 155 mph. 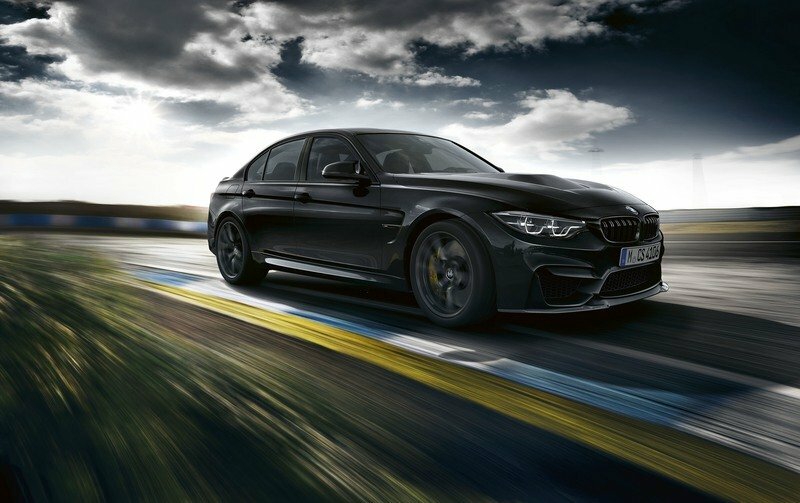 But while you don’t get the performance and the extra features of the M3 CS, you do get an aggressive looking sedan with a fancy interior and state-of-the-art tech. What’s more, the AMG C63 S is significantly more affordable, retailing from $73,700. 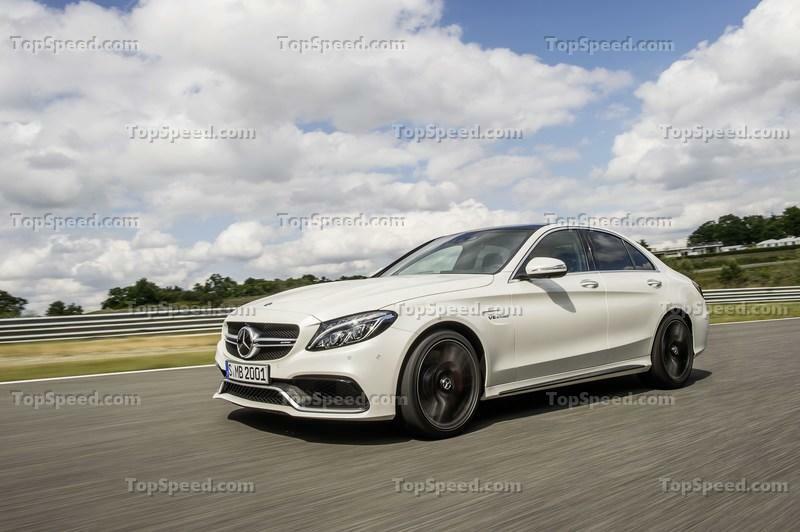 Read our full story of the 2017 Mercedes-AMG C63. With the M4 having already spawned GTS and CS versions, it was a bit surprising that the M3 didn’t get a limited-edition variant in all these years on the market. 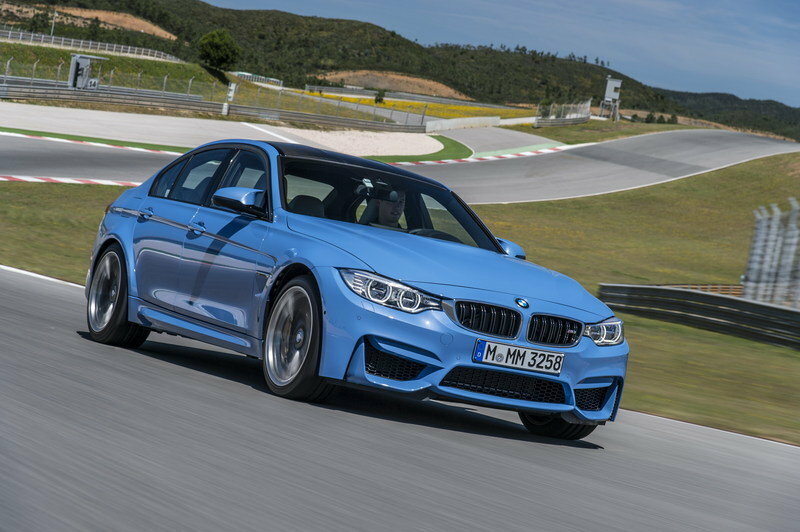 But BMW finally did the right thing and gave the sedan the higher performance treatment. It’s a bit late to the party, but at least the German firm didn’t completely ignore the nameplate. Granted, most higher performance upgrades are associated with the coupe version of the previous M3 generations, but the sedan is just as important and ignoring it won’t be good for business. The fact that the Mercedes-AMG C63 significantly more powerful than the stock M3 in both trim shouldn’t have been enough to motivate BMW to act in this direction, more so with Audi still not offering a sedan version of the RS4. But, as I said, better late than never. I’m still a bit disappointed that there’s no M3 GTS to talk about, but I can understand that a high winged sedan isn’t a priority for BMW right now. 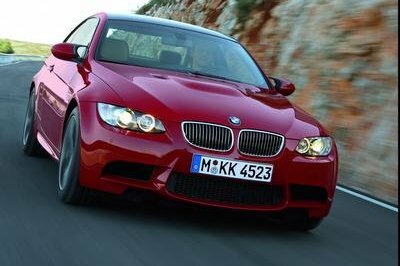 What matters is that the M3 CS is more exclusive and more track oriented than any of its competitors. And this should keep enthusiasts happy. 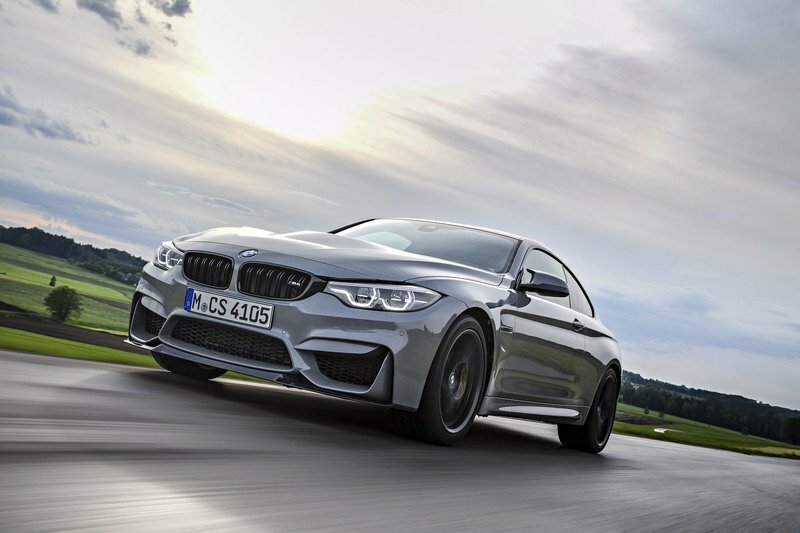 Read our full review on the 2018 BMW M4 CS.